The following information is a quick 'at-a-glance' compilation of just some of the useful things you may wish to know about Blythburgh. 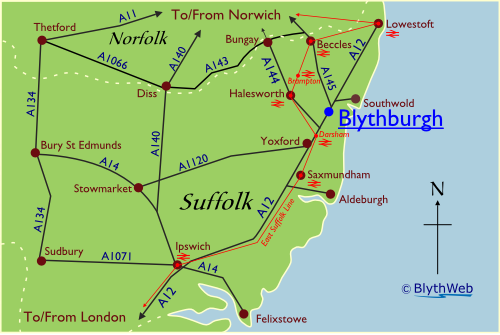 You may also wish to consult the Blythburgh Village Map, which gives street names and the locations of places of interest. Suffolk Coastal District Council (website). Clerk to Blythburgh Parish Council. Hide available for birdwatching - follow the footpath just off the old Southwold Railway track. Bus stops located in London Road. Services to Halesworth (East Suffolk Line train station) and Southwold, with links from both to destinations further afield. For general local travel see the 'Travel Information' section of our Useful Links. Holy Trinity Church, Church Lane, Blythburgh, Halesworth, Suffolk IP19 9LP. Bellringers ~ contact Peggy 01502 478580. Bins for various items located at Old Station Yard, Station Road, Blythburgh, Southwold, Suffolk IP19 9LQ. This area also serves as a car park - useful for walkers, birdwatchers. Both stations are on the East Suffolk Line (London Liverpool Street - Ipswich – Lowestoft). Blythburgh Village Hall, London Road, Blythburgh, Halesworth, Suffolk IP19 9LQ. Tel: 07850 140581 (bookings). Blythburgh Newsagents & Stores, White Hart Inn, London Road, Blythburgh, Halesworth, Suffolk IP19 9LQ. Tel: 01502 478833.